邁向馬拉松之路 Enthusistence - 我的長跑日誌 - 香港長跑網 - 長跑長友 - Powered by Discuz! 01. FlorenceBarsosio:"Acclimatize slowly when training in hot conditions"
02. Robert Cheruiyot:"I thought I was training hard until I joined a group of runners who were racing faster than me, then I realized." 03. Ibrahim Hussein:"When hill running, use your arms and hips to work into a rhythm on the hill." 05. 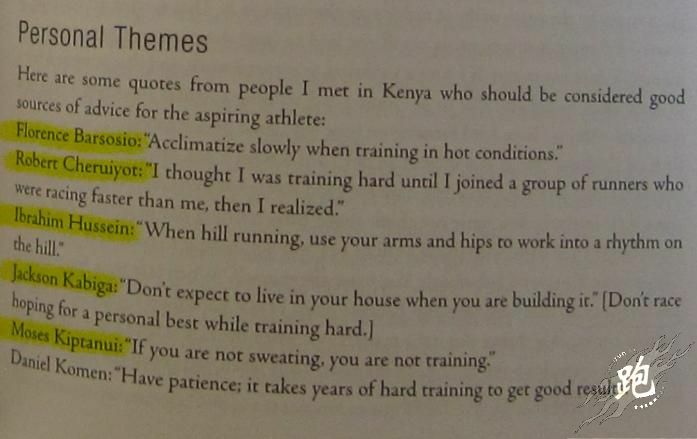 Moses Kiptanui:"If you are not sweating, you are no training." 06. Daniel Komen:"Have patience; it takes years of hard training to get good results." 07. Christopher Kosgei:"Believe you can do it." 08. William Mutwol:"If you run and train as a team, you can defeat anyone." 09. Brother Colm O'Connell:"Remember,even 13-year-old girls are training three times per day." 10. Peter Rono:"Aim high, and then higher. Training hard -- that is all." 11. Simeon Rono:"Learn to run when feeling the pain; then push harder." 12. William Tanui:"Train in an environment that is the best you can find." 13. Paul Tergat:"Ask yourself, 'Can I give more?' The answer is usually 'Yes' "
15. Kip Cheruiyot:"Under race conditions, think about your stride length, especially if you want to catch a runner up ahead on the track, just gently increase your stride length, instead of your stride rate. If you feel good after 400 meters in a race, do not wait;push on. Regardless of what the other runners' advantages are, when you feel right, then go for it. If you want a long career, then race sensibly and nottoo often to aviod the all-too-common burn out syndrome." 16. 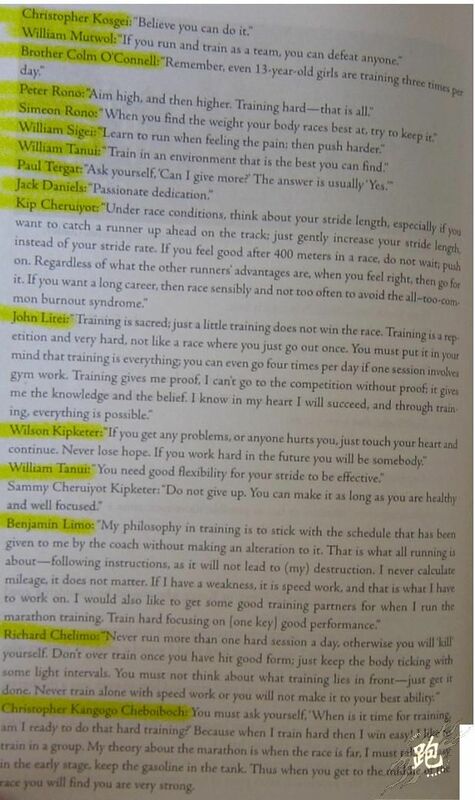 John Litei:"Training is sacred;just a little training does not win the race. Training is a repetition and veryhard, not like a race where you just go out once. You must put it in your mindthat training is everything; you can even go four times per day if one session involves gym work. Training gives me proof, I can't go to the competition without proof; it gives me the knowledge and the belief. I know in my heart Iwill succeed, and through training, everything is possible." 17. Wilson Kipketer:"If you get anyproblems, or anyone hurts you, just touch your heart and continue. Never losehope. If you work hard in the future you will succeed, and through training,everything is possible." 18. Willam Tanui: "You need good flexibility for your stride to be effective." 19. Sammy Cheruiyot Kipketer:"Do not give up. You can make it as long as you are healthy and wellfocused." 20. Benjamin Limo:"My philosophy in training is to stick with the schedule that has been given to me by the coachwithout making an alteration to it. That's what all running is about --following instructions, as it will not lead to (my) destruction. I never calculate mileage, it doesn't matter. If I have a weakness, it is speed work,and that is what I have to work on. I would also like to get some good training partners for when I run the marathon training. Train hard focusing on [one key] good performance. " 21. Richard Chelimo:"Never run morethan one hard session a day, otherwise you will 'kill' yourself. Don't overtrain once you have hit good form, just keep the body ticking with some lightintervals. You must not think about what lies in front-- just get it done.Never train alone with speed work or you will not make it to your bestability." 22. Christopher KangogoCheboiboch:"You must ask yourself, 'When is it time for training, am I ready todo that hard training? Because when I train hard then I win easy! I like totrain in a group. My theory about the marathon is when the race is far, I musttake it easy in the early stage, keep the gasoline in the tank. Thus when you get to the middle of the race you will find you are very strong." GMT+8, 2019-4-23 15:02 , Processed in 0.157386 second(s), 29 queries .